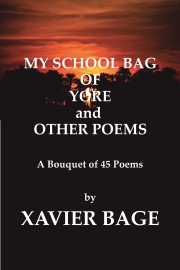 Description of "MY SCHOOL BAG OF YORE and OTHER POEMS"
My School Bag of Yore is a bouquet of 45 poems written in the months between November 2012 to December 2015. There were many more written during that period but I have selected these finding them appropriate for this anthology. You will find in the lines of these poems a child, a boy, a father, a teacher, a doctor, a believer, a social worker, a dreamer. You will encounter love, hope, faith, joy and many such human realities which I have experienced in my life. Xavier Bage is a social worker and teacher working for a charitable organization near Kolkata. He is a foster-father to orphans. He is also a homeopathic physician serving mainly the poorer sections of the society. He is a regular blogger at several writing sites. His English and Hindi poems are archived in his personal blog franxword.blogspot.com. Reviews of "MY SCHOOL BAG OF YORE and OTHER POEMS"